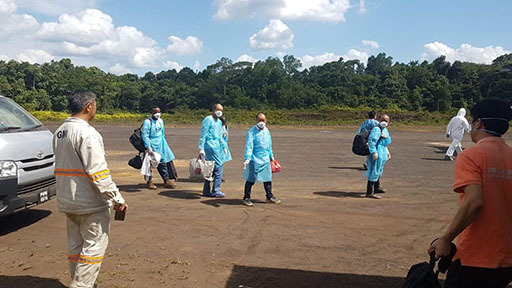 Following a battery of tests, the Ministry of Public Health last night ruled out the Swine Flu strain of the H1N1 virus as being responsible for the death of a Guyana Manganese Inc (GMI) worker and the hospitalisation of others. A statement from the Public Health Ministry last night also disclosed that Zika, Chikungunya, Dengue, and Influenza A and B were also ruled out and that so far there has been no evidence of person to person transmission. However, it noted that two of the patients have tested positive for Leptospirosis, which is known to be spread through direct contact with rat urine or faeces. The ministry said further tests are being conducted locally and samples will be sent overseas with the support from the Pan American Health Organization (PAHO) and Caribbean Public Health Agency (CARPHA) to conduct additional tests to rule out other possible infections. “We are taking all necessary precautions to ensure staff and members of the community at Matthews Ridge are kept safe,” it added…..